Eighty8 Phnom Penh i Phnom Penh, Kambodsja: Bestill nå! 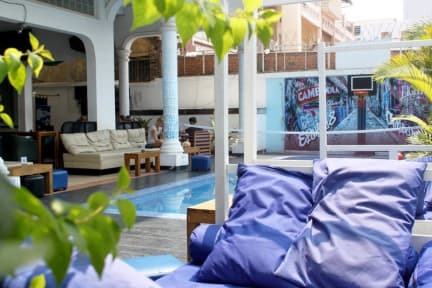 Eighty8 Backpackers hostel is an oasis within the heart of a bustling Phnom Penh with a swimming pool for that much needed cooling dip. We are not only a fun social hostel, but also a great place to chill out, relax, meet fellow travelers or make new friends, and of course, we can party too. We love our location, away from the seedier, noisier parts of the city you get a real insight to Cambodian city life and Khmer culture, with a local shops & a street market on our doorstep, along with many Khmer style restaurants & coffee shops in neighbouring streets. There is even a KFC and a Starbucks for those missing a taste from home, along with four of the city’s top restaurants within easy walking. We are a short 3-minute walk from Wat Phnom the traditional centre of the city and close to the Central, Old & Night Markets which is the starting point of Phnom Penh’s famous Riverside and Royal Palace area, making our hostel a great place to escape the bustle of the city while remaining near to great attractions and nightlife. Everything within the city is only a $2-$4 Tuk-Tuk ride away, so we always recommend using our in-house Tuk-Tuk share sign up sheet to save costs. All Eighty8 rooms come with AC, fan & hot showers as standard and we have free high speed Wi-Fi throughout the hostel. We have both Twin and Double bed Private rooms, for added flexibility, they all have en-suite bathrooms, with some rooms having balconies, room safes, wardrobes and daily water along with tea & coffee making facilities. Our dormitory rooms come with big personal lockers and en-suite shared bathroom facilities and each bed has USB charger socket and reading light. A recent addition to the hostel are the new sleeping pods, a dormitory style room with private sleeping pods & lockers with shared private en-suite bathroom cubicles. All pods come with reading light, USB charger sockets, fans and room AC. Eighty8 has a large common area with a big screen for sports and events along with a Restaurant (open 7am to 10pm) & Bar (open 7am to 12am) serving both Khmer and western delights along with cold Cambodia beers and fab cocktails. There is also a late night snack menu from 10pm to 12am, for anyone with the late night munchies. We have a swimming pool set up for pool volleyball and a basketball hoop for a bit more pool fun. We have a Pool table that is free to use, so watch out for the Killer pool competitions and free drink games. Join in and make new friends, head to a nightclub together or arrange to share a tour. Alternatively grab a book from our free book swap library and read in daybed or beanbag, sit back, chill out and let the world go by. Our Reception and travel desk is open from 6:30-10pm daily, catering for all travel needs throughout Cambodia and beyond, including airport transfers, buses, trains, planes, boats and ferry tickets. We also have visa and laundry services along with a small shop and free luggage storage. Outside these times we have 24-hour security ready to assist with early check outs, late arrivals or any questions that may arise during your stay. Our property is recommended by several Southeast Asia guides and is currently rated the best value in Phnom Penh. noon on the original date of arrival. will result in a cancellation fee equal to the first nights stay. of the booking will be charged.